• Josh Hane, Hunting for clues to global warming, New York Times, 16 December 2011. • Justin Gillis, As permafrost thaws, scientists study the risks, New York Times, 16 December 2011. 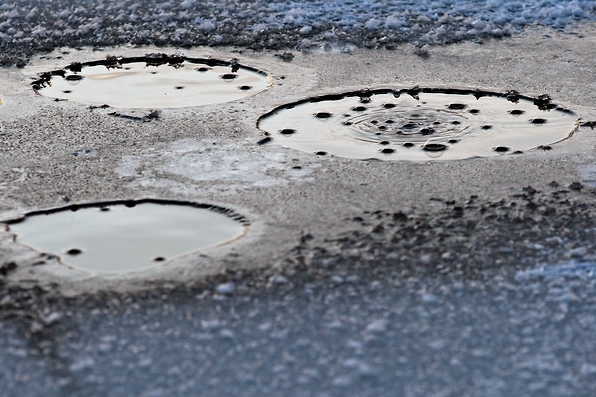 They track Katey M. Walter Anthony, an assistant professor at the Water and Environmental Research Center at the University of Alaska Fairbanks, as she studies methane bubbling up from lakes—as shown above. These lakes form in an interesting way. 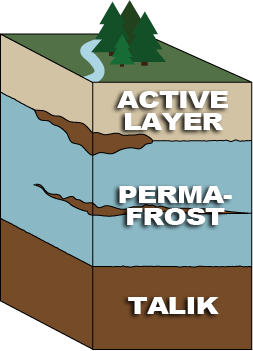 Permafrost is permanently frozen soil lying beneath a layer 0.6 to 4 meters thick of soil that thaws in the summer and refreezes in the winter: the active layer. The permafrost itself can be much thicker—up to 1500 meters in parts of Siberia! As far as I can tell, talik is permanently unfrozen soil on top of, amid or beneath the permafrost. Permafrost is rock-hard and solid. 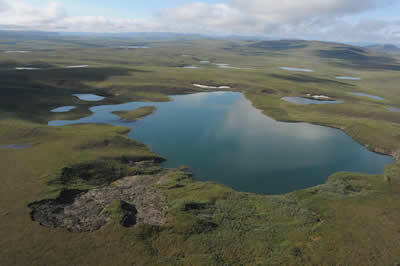 Liquid water does not pass through it, so permafrost environments tend to be poorly drained and boggy. But when permafrost starts to melt, it becomes soft. Soil sinks down into marshy hollows separated by small hills, forming a kind of terrain called thermokarst. Trees in this terrain can lean crazily as their roots sink, creating drunken forests. • Evelyn C. Pielou, After the Ice Age: the Return of Life to Glaciated North America, U. Chicago Press, Chicago, 1991. So, please don’t misunderstand: I’m not trying to say that thermokarst lakes, drunken forests and the like are signs of disaster. However, as the Earth warms, new regions of permafrost are melting, and we’ll see these phenomena in new regions. We need to understand how they work, and the positive and negative feedbacks. For example, thermokarst lakes are darker than their surroundings, so they absorb more sunlight and warm the area. Most importantly, as permafrost thaws, it releases trapped carbon in the form of carbon dioxide and methane, which are both greenhouse gases. Since there are roughly 1.7 trillion tons of carbon in northern soils, with about 90% locked in permafrost, that’s a big deal. Scientists have calculated that the fire and its aftermath sent a huge pulse of carbon into the air — as much as would be emitted in two years by a city the size of Miami. Scientists say the fire thawed the upper layer of permafrost and set off what they fear will be permanent shifts in the landscape. Up to now, the Arctic has been absorbing carbon, on balance, and was once expected to keep doing so throughout this century. But recent analyses suggest that the permafrost thaw could turn the Arctic into a net source of carbon, possibly within a decade or two, and those studies did not account for fire. By the way, if you click on these scientists’ portraits, you’ll see where they work. If you’re a student looking for an interesting career, consider these options! 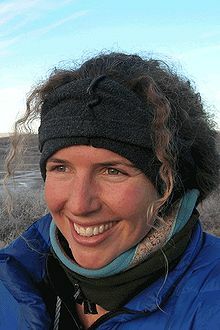 For example, Michelle C. Mack—shown above—runs a lab, and you can see her postdocs and grad students, and what they do. • Melting Permafrost (Part 1). • Melting Permafrost (Part 2). This entry was posted on Monday, December 19th, 2011 at 6:39 am and is filed under carbon emissions, climate. You can follow any responses to this entry through the RSS 2.0 feed. You can leave a response, or trackback from your own site. How does talik atop permafrost differ from the ‘active layer’? The active layer freezes in winter, unlike the talik. Okay, that’s simple enough! Thanks! The Antarctic temperature records indicate that the present interglacial is relatively cool compared to previous interglacials, at least at these sites. The Liesecki & Raymo (2005) sediment reconstruction does not indicate significant differences between modern ice volume and previous interglacials, though some other studies do report slightly lower ice volumes / higher sea levels during the 120 ka and 400 ka interglacials (Karner et al. 2001, Hearty and Kaufman 2000). However, since geological records such as ice cores and sediments represent an average often on the scale of thousands of years, direct comparison to current values can be misleading. Larger, short term variations in ancient climate are not present in the fossil record. Hence the comparison is not comparing like with like and is scientifically invalid. My conclusion from five minutes of specific research (and years of experience) is that we don’t really know how the earth’s current “temperature” compares with that of previous interglacial periods. Contradictory evidence is welcome. In the New Policies Scenario, cumulative CO2 emissions over the next 25 years amount to three-quarters of the total from the past 110 years, leading to a long-term average temperature rise of 3.5°C. China’s per-capita emissions match the OECD average in 2035. Were the new policies not implemented, we are on an even more dangerous track, to an increase of 6°C. Being a pessimist, I consider a 6°C rise perfectly plausible over the next century or two. But anyway, my sentence was misleading, and this whole issue of whether we surpass previous interglacials is not quite relevant to my main point, namely that we should learn more about melting permafrost and its effects… so I’ve rewritten it. Thanks! Description of the scenarios here. Judith Curry yesterday posted an Arctic Update. at the very end there is a link to the 4 degrees conference in Oxford 2009. This (emphasis on the evidence for susceptible clathrates and the probability of dissociation soon) has been a hot topic on blogs elsewhere. Anything from the scientists reading Azimuth that’s not been discussed on other sites recently worth knowing? 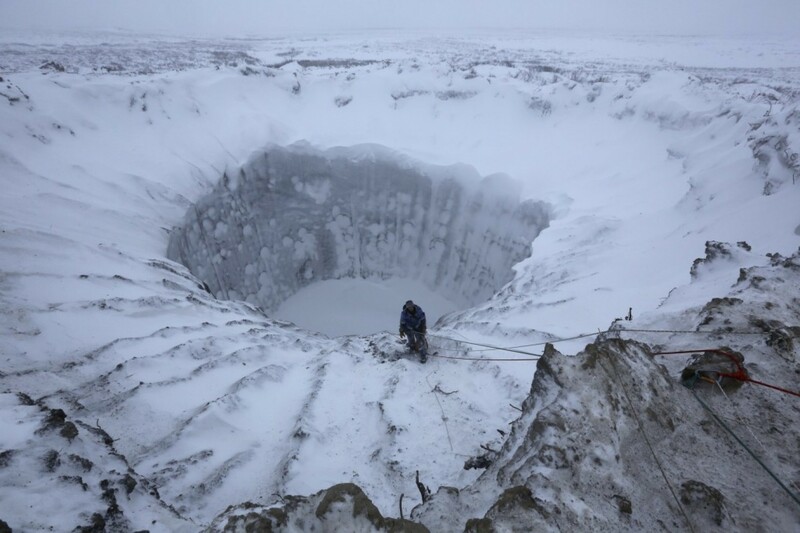 Russian scientists have recently found more new craters in Siberia, apparently formed by explosions of methane. Three were found last summer. They looked for more using satellite photos… and found more!